The backlog of retirement claims at the Office of Personnel Management saw a small increase in September despite fewer new claims coming in than during the previous month. The latest backlog now stands at 17,628, .66% higher than in August and 4.75% higher than at the same time a year ago. 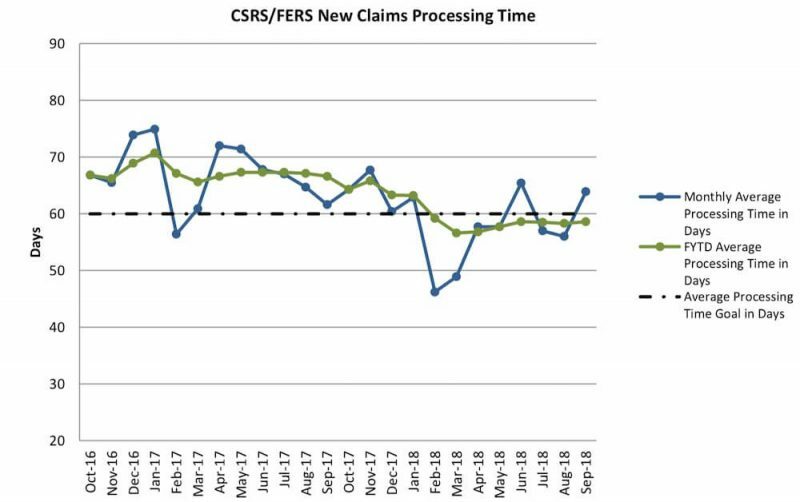 OPM received 7,142 new claims in September, 19% fewer than it did in August, yet it managed to make a sizable reduction in the backlog in August despite the higher number of incoming applications. Processing times were faster in August than in September which was likely a factor; 56 days on average versus 64. OPM said in its FY 2018 – 2022 strategic plan that its goal going forward is to get the average retirement case processing time down to 60 days or less. In FY 2017, OPM processed retirement cases in 67 days on average. In FY 2018, it averaged 59 days for monthly case processing time. Clearly, the agency is making progress in this effort since this is a significant improvement over the previous fiscal year. It will be interesting to see if OPM can continue to meet or improve this goal over the next few years. The latest complete data as published by OPM are included below.